Move! participants work together to imitate details in Joseph Ducreux’s Self-Portrait, Yawning. What do art objects ask us to do? As a museum educator, I think a lot about how people relate to artwork. In the galleries, I often observe that visitors adhere to a conventional “museum” body language: walking slowly, observing, perhaps repositioning to notice a detail or read a label, and then moving along. According to one study, art museum visitors spend an average of just 17 seconds looking at each art object before moving to the next. Traditionally, interpreting artwork has relied upon passive reception—reading, listening, silence—as the primary mode for visitor experience. For many, this method seems sensible. It relies on the assumption that an artwork’s meaning is revealed through its physical composition, aesthetic components, and cultural context. Often, however, this view pushes interpretation outside the viewer’s body. When I first started exploring art museums, I thought that reading or being told about an artwork meant that I completely understood it. Only later did I realize that “authoritative voice” was not the same as “absolute truth.” Gradually I learned that art rewards close investigation, and that repeat encounters with objects can change our understandings. Conversations with friends refined my interpretations, and it became clear that passive reception was just one of many tools for engaging with objects. Individual experience was not only possible, I began to see, but a critical part of building deeply meaningful experiences with artwork. Asked to find his favorite hands in the gallery, a participant chooses Pietro Cipriani’s Dancing Fawn and then spends a few minutes improving his imitation’s accuracy. In the J. Paul Getty Museum’s Education Department, we are exploring how a more vigorously embodied engagement with art might look. We encounter the world with all of our senses. Which of these senses do we privilege or not privilege in the gallery? Can art objects ask us to respond physically? Drawing from precedents as diverse as the Metropolitan Museum’s 1970s Arts Awareness program, spiritual traditions that emphasize mindfulness, and kinesthetic pedagogy, our working group spent this spring brainstorming in-gallery techniques new to the Getty. 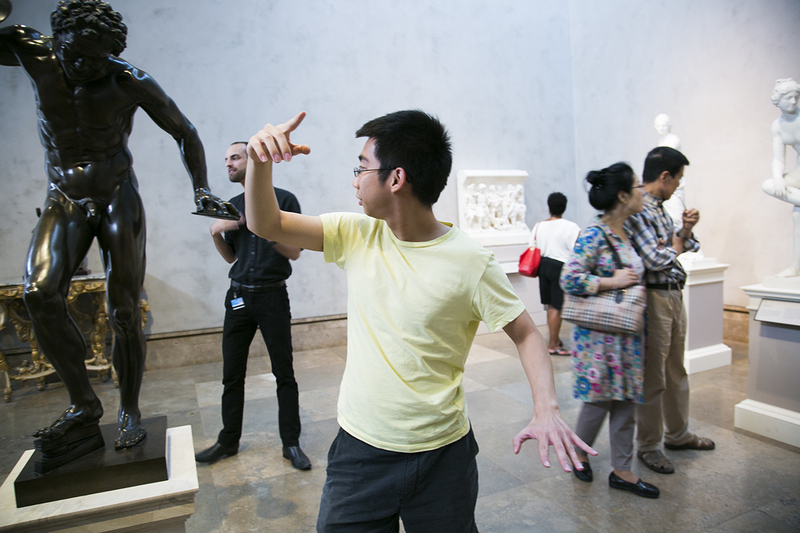 Recognizing that embodied learning is inherently interdisciplinary, we sought expertise and insights from educators across the Museum, as well as MFA choreography students from UCLA. 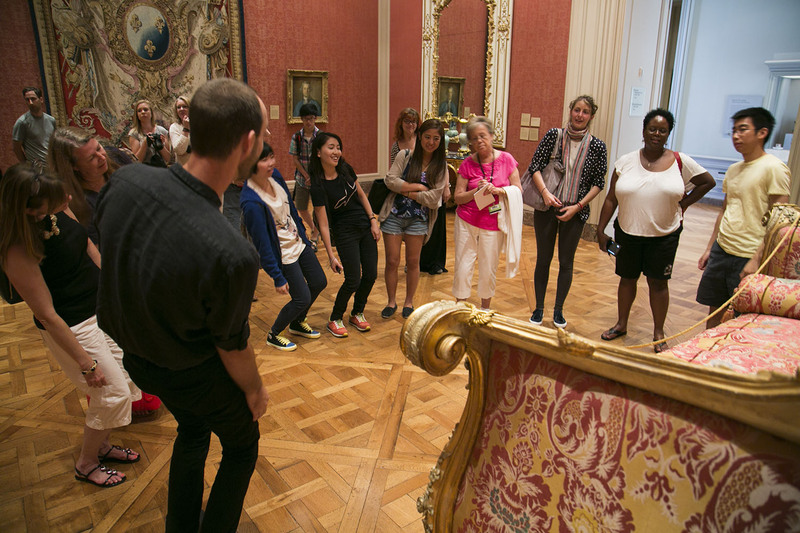 “Are we allowed to move like this?” As participants explore what the Pink Bed might be asking of them, this frequent question reflects the tour’s playful subversion of behavioral norms. The product of this exploration is a new, weekly tour offering called Move! Specifically designed to engage body and mind, Move! is intentionally brief: a visitor need commit only 45 minutes to join the experience. The tour includes movement for all ages and ability levels, and we welcome anyone willing to explore. 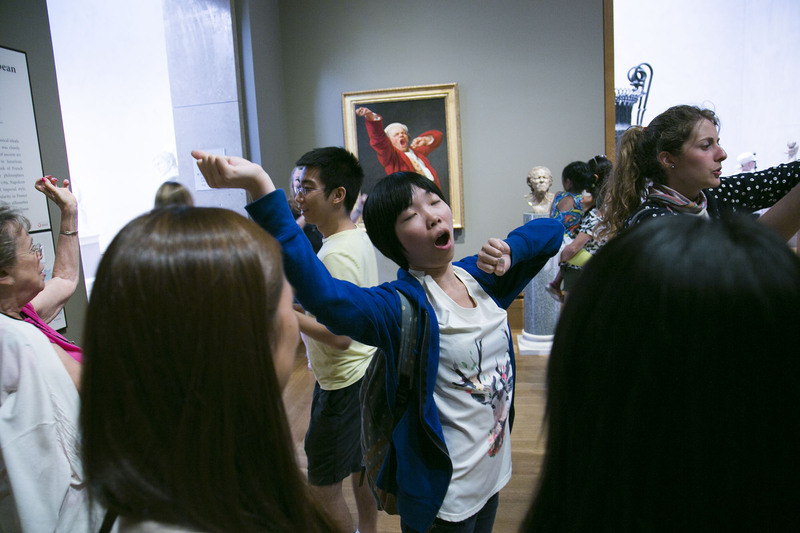 The tour offers visitors a chance to step into a physical exchange with other group members as well as art objects. A Getty Museum educator facilitates the conversation. With reminders only to respect one another and the objects, the tour launches as an interactive, non-traditional exploration of selected artworks in the collection. 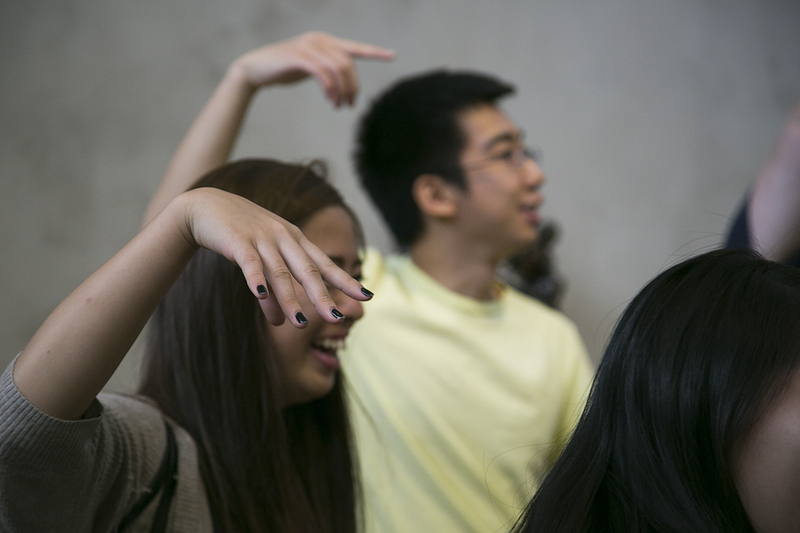 “Hands in!” as participants affirm one another before tossing the group’s imaginary ball to the next gallery. 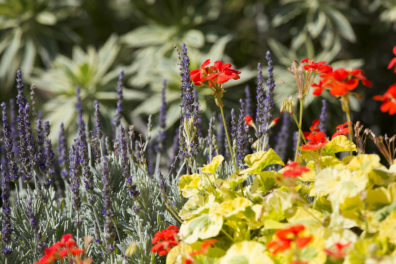 During the tour’s first iterations so far, visitors have remarked that specific personal interests drew them to the tour. For some, background in dance or yoga is the impetus to join. 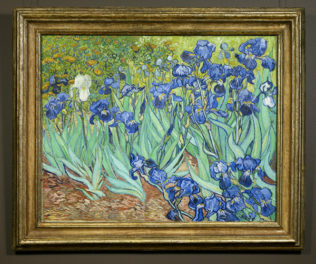 For others, the tour affords family and friend groups of diverse ages a more active way to experience art. 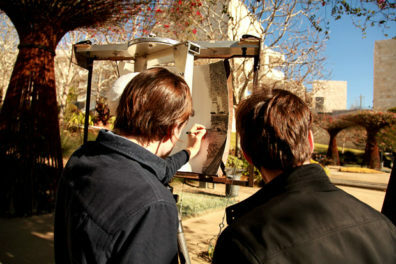 All share the goal to do something out-of-the-ordinary at the Getty. Move! focuses intensely upon collaboration. Participants divide into different groups for conversation and teamplay, and the tone is intentionally inquisitive. The museum educator prioritizes an inclusive environment, affirming participation while also pressing visitors to look closely and deeply consider the artworks on the tour. 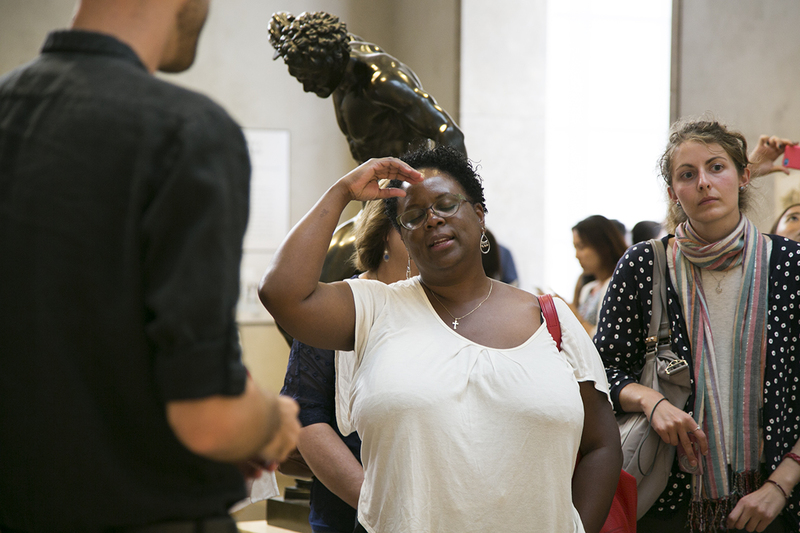 In one portion of the tour, participants are asked to explore Getty Center Gallery W101, which is filled with neoclassical sculpture, and identify a sculpture with their “favorite hands.” Once chosen, each participant practices imitating the hands. When the group reconvenes, individuals “display” their own hands and the group collectively identifies which sculptures are being depicted. Participants lead the group from sculpture to sculpture, explaining not only which hands they chose but why. Questions about the sculptures and their artists allow the museum educator to share relevant information, and conversation builds as participants add, modify, question, and clarify with additional insights. In a big reveal, group members displays their “favorite hands” at the same time. 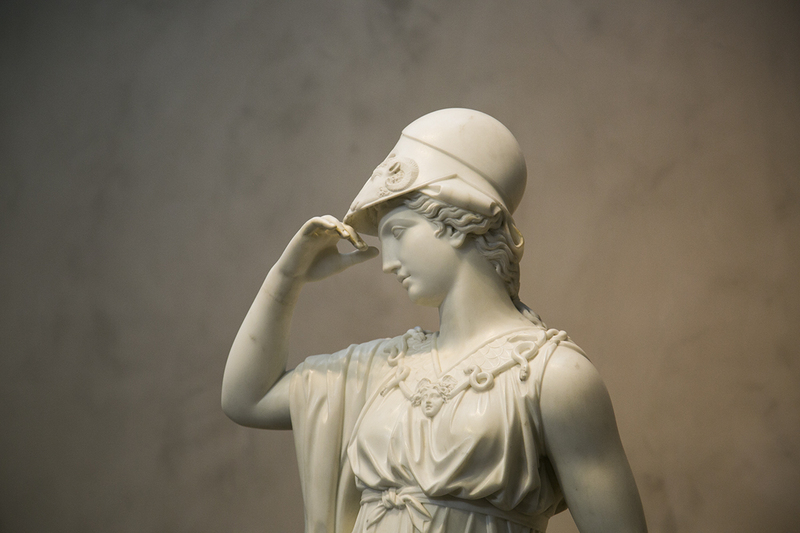 Joseph Nollekens’s Minerva inspires multiple imitations on this tour. Participants compare and contrast her posture with that of Nollekens’s Venus and Juno, displayed nearby. Laughing while imitating, a participant explains why she chose the hands of Nollekens’s Minerva as most evocative. 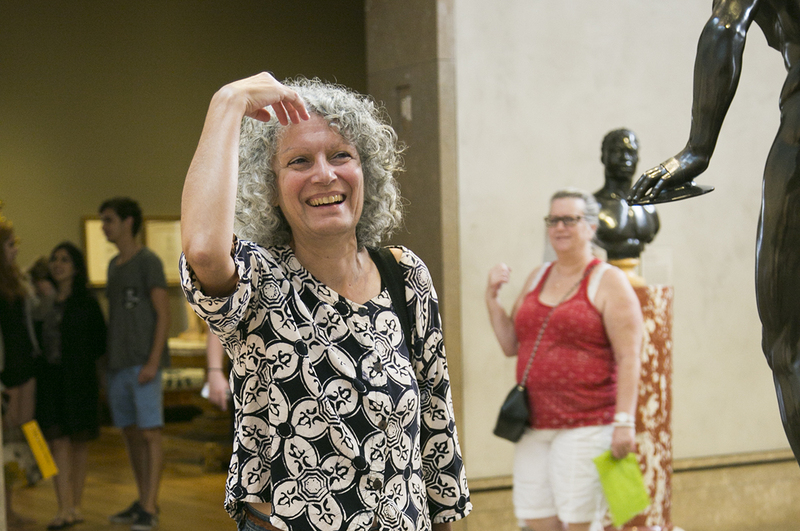 As this participant articulates the right hand’s position in Nollekens’s Minerva, questions about the arm’s placement lead the group to investigate the object’s presentation of strength and gender. Move! is offered at the Getty Center most Saturdays at 2:30 p.m. Find a full schedule of talks and tours on our event calendar. I'm an associate education specialist at the J. Paul Getty Museum. Currently, I work with K-12 educator professional development and in-gallery experiences for all audiences. As an educator, I like to ask: am I fostering empathy, inquiry, critical discourse, and/or meaning making between the museum and its public? If so, then I'm on the right track! Great article! Wish you much success with the imaginative “Move!” program–it really enhanced the museum experience. I participated that day–it was so much fun, and a unique way to interact with other visitors. Terry, it was a pleasure having you join the group and I am glad that you enjoyed the experience. Thank you for the kind words and I hope you continue engaging with art as fully as possible! Wow! Andrew, this is awesome. I hope to visit and enjoy the Getty this way. Thanks Carter – I’ll look forward to it!